Microsoft is changing the way you back up your data by integrating its cloud-based storage and sharing service SkyDrive. In the event of a system crash, Microsoft has new features for quick and easy restoration of your computer, with minimal data loss. In addition to the new features PC Reset and PC Refresh, File History is a great new feature in Windows 8 and will be released in Windows 8.1. File History is a backup application that allows for continual protection of your personal files stored in Desktop, Libraries, Favorites, and Contact folders. The new feature will periodically scan the file system for any changes and copy all changed files to another location and store the copy to an external storage device selected by the user. While the new File History Feature won’t be enabled by default, you can easily turn it on by using the keyboard shortcut Windows Key + W that brings you to a “Settings” search box. Once you’re there, type “file history” and select the “File History” Icon. Once your File History feature is open it will search for compatible drives that are connected to your system. 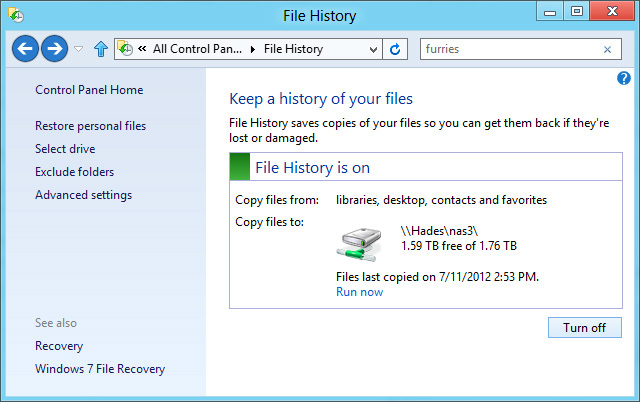 File history will work for any extra internal, external, and network drives. The File History feature should connect to the drive with the most amount of free space, or you can select the specific drive you’d like to use. To do this, click the “Select Drive” link in the column to the left and choose the drive you’d like to use. Once you’ve selected the drive, go back and turn on the File History. By default, all your documents should be backed up in Desktop Items, Favorites, Libraries, Contacts and your local SkyDrive folder (as long as SkyDrive desktop is installed in your Windows 8 computer). Looking to gain more control of how often copies of your files are saved? Go to Advanced Settings and select the size of the offline cache and the number of times versions are being copied and saved. How about using File History to copy your spreadsheets and documents only? You can exclude certain folders to save space. For instance, you probably don’t need a complete copy of your music collection. Navigate to the location of the file that you’re searching for in Windows File Explorer. Locate the “Ribbon” and click on the History Icon. The most recent backup copy of the file will appear, but you can navigate back to earlier dates. Highlight the file you need to recover, and click the green “Restore” button. The file will then be placed in its original location. Keep in mind this new feature won’t benefit you if you don’t turn it on!